Use a Trusted Certificate (digital-certificate.txt) and a private key (private-key.pem) to achieve silent printing*. A language capable of reading an RSA private key and generating an SHA1 base64 encoded signature hash. Generate a Trusted Certificate (digital-certificate.txt). Edit qz.security.setCertificatePromise() to use your Trusted Certificate. Edit qz.security.setSignaturePromise() to use your server-side signing method. Edit sign-message.php to sign print requests with your private key. Examples in other languages can be find in demo/assets/signing of QZ Tray. Note: Your public-key.txt is not needed for signing. Store your public-key.txt securely as you will need it for generating a new Trusted Certificate when it expires. A sample certificate chain is provided with the demo, labeled as "localhost". This will display a trusted message on load of the page. Edit the setCertificatePromise() provided in the sample.html file. Replace the "localhost" certificate chain with your Trusted Certificate by changing the $.ajax(...) line to match the address of the certificate. Note: $.ajax is a jQuery function and can be replaced with any ajax library of choice (xhr, PageMethods, etc). These methods are invoked on any privileged function, which includes finding attached devices, printing, or sending/reading data from a USB or serial device. Change the $.ajax(...) line to match the address of your php file. A server-side signing method must be used in combination with the AJAX call. This signing will happen with your company's private key. Trusted websites with a valid public key chain pair and a properly configured qz.security.setSignaturePromise AJAX function will unlock QZ Tray's ability to communicate silently (print, read serial ports, usb devices, etc). 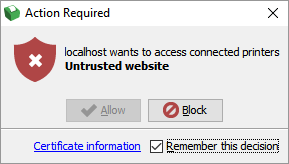 Non-signed requests (Untrusted websites) will continue to show a warning dialog. This will no longer come from an untrusted source.